WAR RUG? WHAT THE HECK? Hi folks! Ruthie here with Arizona Oriental and Specialty Rug Care here in Prescott AZ and today I wanted to share with you a rug that we have hanging here in our shop. This rug is what is known as an Afghan War Rug. 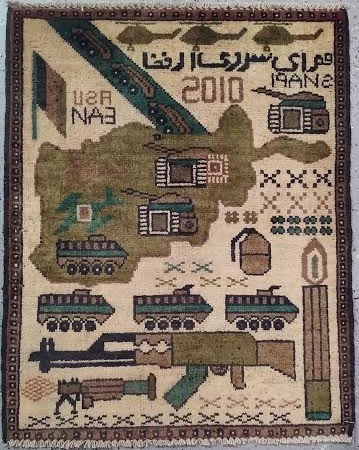 Not the typical floral or primitive figurine design, war rugs have imagery that you don’t usually find on an Afghan rug. I’ve shared in other articles about what the figures in a rug mean – for instance a deer symbol represents well-being while a camel represents wealth. But today I'll take a moment and discuss how symbols woven into rugs change to reflect the world around the weaver. Called “Baluch” by dealers, commercial galleries, and collectors, Afghan War Rugs started showing up in the early 80’s after the Russian occupation of Afghanistan began in 1979. Images of tanks, bazookas, helicopters, and machine guns were weaved into the wool rugs to show daily life in a region that is occupied with war. Military presence became a part of the country’s landscape and the weavers of these rugs (mostly women and children) reflected this in their work. It should be no surprise that weavers use what is familiar to them to inspire the intricate patterns in their area rugs, so it is no wonder that they would choose to show these images of war in their rugs. No one is quite sure what message the weavers are trying to send by weaving these symbols, but something that collectors (and myself) can all agree on is that these little rugs are interesting and sadly tell a lot about what is most prevalent in the lives of the weavers. I suspect, since weavers will purposely choose a design that they believe will attract buyers, they have adapted this motif to attract the soldiers to buy. Soldiers frequently bring home mementos of their travels and experiences, so why not a war rug? It certainly is original. These rugs were initially marketed toward Russian soldiers and then later American soldiers that have occupied the country. From there, they’ve made their way overseas and into markets here at home. Here at Arizona Oriental we have even seen rugs that depict our own World Trade Center Towers and the devastation we experienced. Now even our own history is being commemorated in the rug weavings. While pretty flower and primitive figure rugs are still my favorite, how can anyone not take notice of the war rugs and the history carefully knotted one strand at a time and not feel something with regards to how their weavers live day in and day out? Hoping you found this bit of information interesting, till next time, enjoy your beautiful art for your floor and remember a clean rug is a rug that can last you a lifetime!